I am so happy to have Natalie, from My Crazy Busy Life, here this week on Small Moments Mondays to share a small moment with us. I wish I lived closer to Natalie because she’s the kind of girl with whom I’d go out for drinks (yes, multiple) and laugh until we cried. She’s funny, down to earth, genuine, and kind. I am so grateful to have her as my friend. 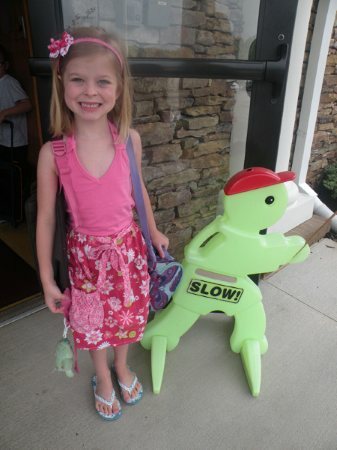 This post tugs at my heart, as Katie is preparing to start preschool next week…a huge change in our life. Natalie’s words are so lovely. Thank you, Natalie, for sharing this here. I am so grateful for your generosity! For the past year or so, I’ve hoped the preschool would start a carpool, drop off line. I thought it would be great if I could let my youngest out at the door so I didn’t have to get out and walk her in. That way, I wouldn’t feel so guilty about dragging myself out of the house in my pj’s & attempting to inhale my first cup of coffee. Not that long after Christmas break, I got what I wished for. The school sent home a letter that they would begin a preschool drop off line. I should be ecstatic right? I should feel over-the-moon-happy about it. I mean, this is EXACTLY what I wanted. Right? One morning during the drop off, I look at my little girl- my baby- looking so big in her booster seat and waiting our turn. She was so excited about getting dropped off, “just like her brothers.” And it hit me. She would be starting kindergarten soon. She’s no longer a baby, toddler, or even preschooler. My little girl was officially a kid. That one moment changed how I viewed the carpool lane. It was no longer a convenience. It was moving us forward to another phase of life. Each little thing you cross off the list… The bottles, the diapers, bloomers with dresses, carseat, then eventually you realize their physical need for you is gone. They are physically capable of walking into school safely. Physically capable of getting through life without you. I’m now in the phase of guiding her to who she is meant to be. That moment made me intensely miss the days I still had a baby. Please go say hello to Natalie over on My Crazy Busy Life. Don’t miss Best Birthday Card Ever, Finding Your Words, and Sweet Home Chicago. You can also find Natalie on Twitter. Go follow! You’ll love her, I promise! Aack! I was just thinking at Abbey's recital that she is getting so big. What a lovely post, because it really captures that desire to move forward but also keep everything the same. I mean seriously. They grow up WAY too fast! Sadie starts Pre-K this fall. I mean what????? And be extra careful, because I just turned 27 last week and I was only 8 years old only a few days before. Crazy! Lovely post, Natalie. They do grow up so quick! Every day I hug my little one (he's 1.5 years) and inhale his toddlerness. Such a sweet post. My oldest baby graduated from elementary school last week and I'm still getting teary eyed over it! They grow up way too fast! I know. I KNOW. My oldest is starting kindergarten this year, and my youngest is starting preschool. I claim to be excited about the two free mornings a week, but I am hyperventilating on the inside. Hi Natalie so glad Nichols shared you with us! I feel this way very much lately because my twins at 3 are loving and dismissive, needy and independent all at the same time. I wished for an easier time, when they could do more, understand more, be more but with that comes the price of them doing all that farther away from you. It's such a paradox …thanks for letting us know that as moms we all have lots in common. Oh it is so very, very true. When mine started riding the bus this awful disconnect happened for me that I wasn't even part of that for them anymore. sob. Guiding her to who she's meant to be….gorgeous line. I think it especially harder when you have older kids too because you do know first hand exactly how fast it can go. I mourn each stage lost rather than celebrate milestones because I know I'm not having any more children. I feel like I will be the lunatic mom in "Love you Forever" sneaking into her in son's room to rock him when he is a teenager. This is so true. I had such a hard time when my youngest went to kindergarten last year. I think that it's even worse knowing he'll be in 1st grade in the fall. My baby days are long gone and I'm not always ok with that. Y'all are so sweet. This fall is definitely going to be hard. Not only is my baby starting kindergarten, but my oldest will be a freshmen in high school. I would not be ready for a preschool drop off line for my kids. My oldest stopped letting me walk her to class when she was in Kindergarten and that was hard enough. I could feel this down in my bones, Natalie….the mentally crossing off of things that eventually lead them to a life of their own. Wow, your baby! And what a sweet picture. I will NEVER forget the first week of my oldest's first grade year. I was mentally prepared for walking him to his class the whole week. Not him.. He stopped me at the big double doors on day 2 & said, "Mom. I've got this. Love you" And off he went. He went to a private school K-12, so I was walking back to my car between some very big high school kids with tears streaming down my face. I know this angst even I read this w/my 4 week old lying on my chest. Just this morning my 3 year old asked to go to "big girl school. Me ready!" Thanks! I have a feeling I'm going to have a lot of sleepless nights when she starts dating. The little boys are already following her everywhere. Great Small Moment pick, Nichole. Such a bittersweet time. My two start preschool this fall and as much as I am excited for a new phase in their life I can't really imagine them being somewhere were they don't need me every other minute. I was given that book for my very first mother's day. I read it every night before bedtime & it still makes me cry just thinking about it. YAY for Cheeks! I could totally imagine her beaming in pride at being a big girl, though. Even though it saddens you. OMG. This makes me so happy and sad at the same time. Sometimes I look at my baby and get scared at how fast he's growing. This is such a sweet moment! I have these moments all the time. But I'm so looking forward to everything ahead of us. We just need to treasure the moment. The carpools, the paint, the snuggles-all of it. That is a beautiful post! We all have those little moments. I don't have a preschooler yet (my oldest is 2 1/2). I am not anxious for that day to arrive. do you know I worry about these sorts of small moments ALL THE TIME? seriously. things like dropping him off and not walking him into places. Or letting him go to a friend's house without me. Or going with someone somewhere. This post? played with my biggest anxiety.